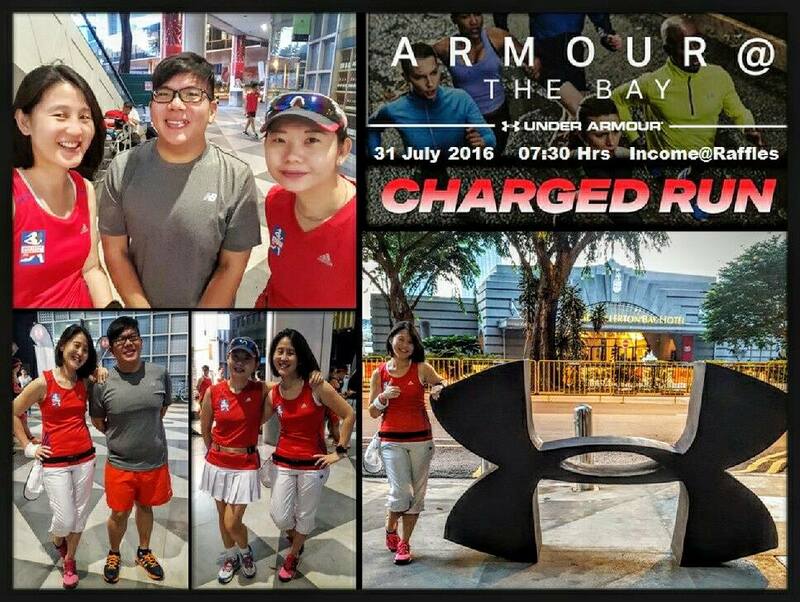 Car-Free Sunday SG on 31 July 2016 – Armour @ The Bay: CHARGED RUN | JustRunLah! Car-Free Sunday SG (#CarfreeSundaySG) is a fun-filled day with loads of activities for everyone! From the young to the old, there’s definitely an activity for you. For exercise enthusiast, you can walk, jog, or cycle around the Central Business District and the Civic District to experience our city in a whole new way! Car-Free Sunday SG turns part of our city into a pedestrian and cyclist friendly precinct and creates a 5 km route of closed roads in the heart of the city. It is part of the larger movement towards a car-lite Singapore, envisioning our city with fewer cars. Today was my first time attending Car-Free Sunday SG. 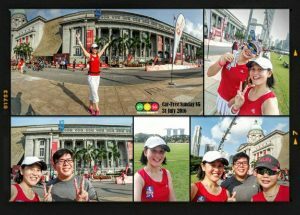 I went with two of my close friends who were also my running buddies, Cheng Yee & Calvin! 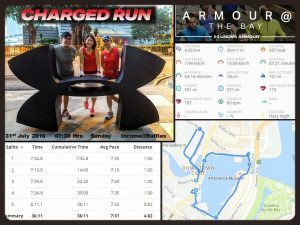 We had decided to do the attend the event [email protected]: UA Charged Run which was organised by Under Armour Singapore. We had to pre-registered for it. This run was a special one, because it was very close to our nation’s birthday and Under Armour had teamed up with GetActive! Singapore to promote the One Team Singapore spirit. 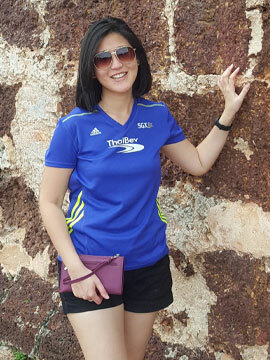 Under Armour was was also offering the first 50 early-birds at the event that day an exclusive ‪#‎UnderArmourSG‬ Block Tee! Participants were also encouraged to come dressed in Red/White. The event started off with registration which started at 06:45hrs. We arrive slightly before 07:00hrs and could see that a huge crowd had gathered at the meeting area. 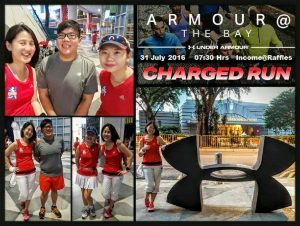 We were not one of the 50 early lucky participants to get those exclusive ‪#‎UnderArmourSG‬ Block Tees but it’s okay, after all, we came for the experience. We quickly registered and decided to help ourselves to the drinks and went to familiarize ourselves with the route just in case we get separated from the group while jogging. The route was a 5km route which will bring you past some of the famous Singapore landmarks like the famous Fullerton Boathouse, Anderson Bridge, National Gallery of Singapore, the famous steps of the City Hall Foyer, Padang, down to the Bay area where you’ll run past the Esplanade, Floating Platform, Double Helix Bridge, Marina Bay Sands and back to the START point. Soon it was time for a quick 15 minutes mass warm up which was lead by one of the Yellow Fellows. The run start promptly at 07:30hrs and it was really nice just jogging along the planned route. 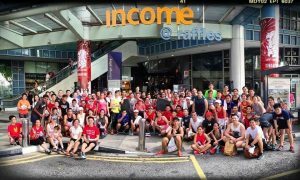 It was my first time seeing sooo many people in the heart of the CBD engaging in fitness activities. At Empress Lawn HPB-SportSG were having their Fitness Party, in front of the steps of City Hall there was also another group about to be flagged off for the walk/run etc. So many activities happening during Car-Free Sunday SG which made the place vibrant. To add to the mood, national day songs were playing in the backgroud which gave the place a celebration mood. There were no bottle necks along the route. What I found extremely helpful was that the organisers of Car-Free Sunday SG did well was having lots of hydration points which offered both water and 100 Plus along the way. It was sooo good to complete our workout for Sunday! When we arrived back, we collected our GetActiveSG goodies which included a towel and some snacks. We also grabbed some isotonic drinks to re-hydrate ourselves. Shortly after, a mass cool down stretch session was conducted by a Under Armour Team member. It is always good to stretch out those tight muscles after a workout. After cooling down, there was a sharing session by Team Under Armour SEA on one of their latest shoe models and a group photo taking session. Overall, it was a really fun way to start our Sunday and definitely a different experience from your normal run events! After the event, we still went to check out the other events around the area. Check out the photo below. Car-Free Sunday SG would be going on a short 2 months break and would return in October but the [email protected]: UA Charged Run would still keep going. It will happen on the last week of every month. 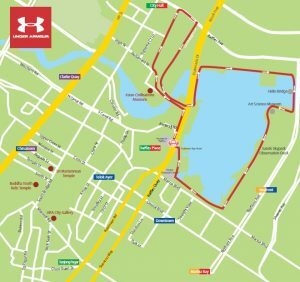 Do stay tuned to Under Armour Southeast Asia Facebook Page for more updates and remember to pre-register for these run if you are planning to go. Till my next post!